If you’d have told me last year that I would be bang into historical fiction I’d have laughed heartily in your face. I used to be the type of person who would pick up a book from the shelves, flip it over to peruse the blurb and on seeing anything akin to ‘It was 1790 in Northern France,’……I would see the date and immediately put the book back down. No thanks, not for me. If it doesn’t refer to iphones or Google then its faaaarrrrr too outdated a story for me….. 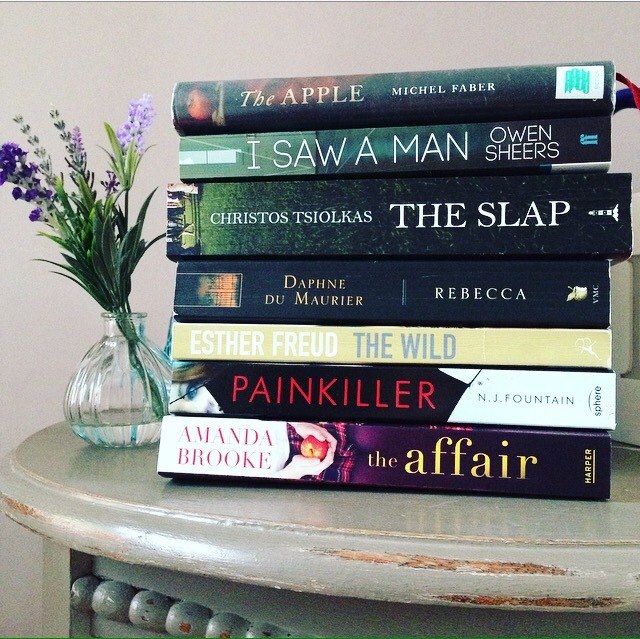 However, you’ll all be pleased to know that I have more or less abandoned contemporary fiction recently in favour of historical fiction which was instigated by one Sarah Waters. I have spoken about her novels and writing style a little on here before and it’s safe to say I’m a huge fan. In The Paying Guests she took us back to WW2 London. In The Nightwatch it was more of the same…..easing me in gently. 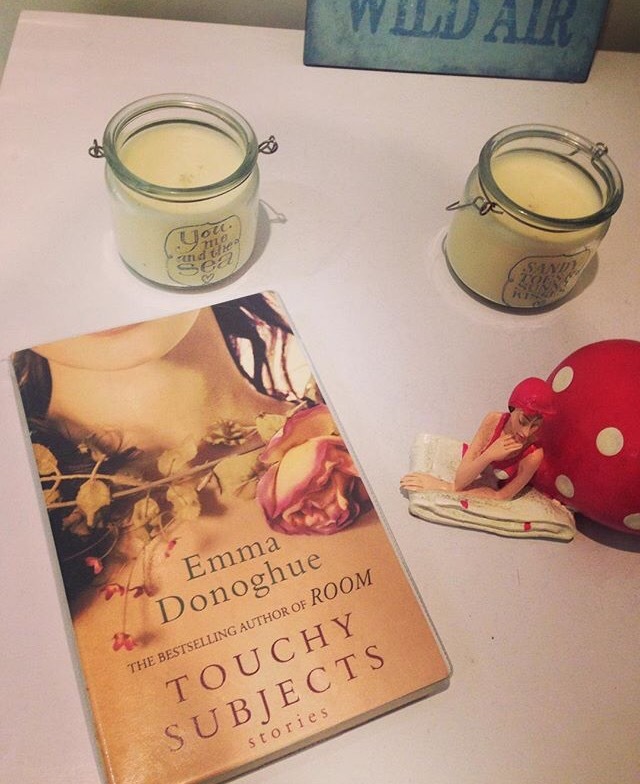 Then it was time for Fingersmith set in Victorian London, Slammerkin by Emma Donoghue bringing more of the same. It was here with Mary and Doll that I fell in love with this time period and the life at that time. Particularly involving prostition and destitution and institutions (all the ‘tions’ there!). 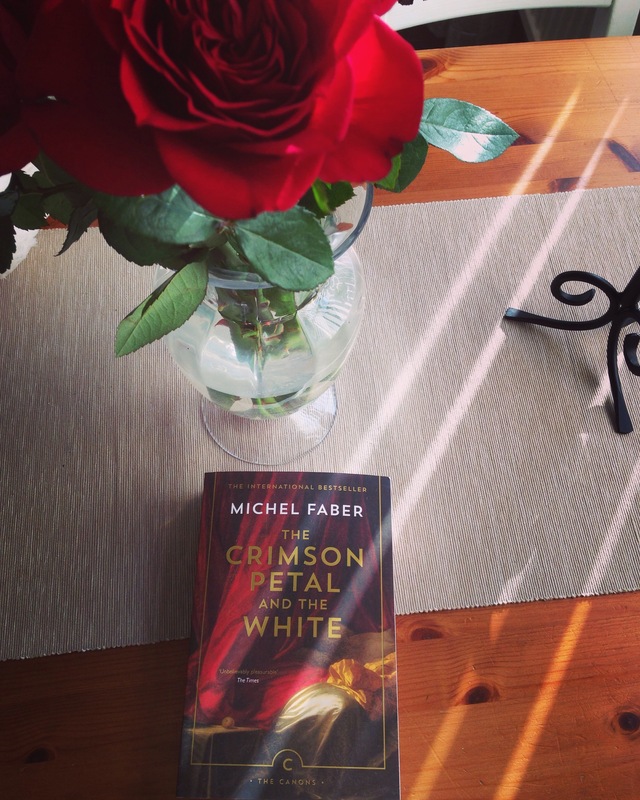 When I saw The Crimson Petal and The White by Michel Faber talked about and reviewed on Booktube I thought it sounded right up my strasse……or right down my proverbial cobbled dirty Victorian back alley if you will. Ooh err. I picked this up from Waterstones, full price no less! I must have REALLY wanted it. Being totally superficial it’s such a lovely book. A big old chunky beast (which I love), tiny print (which I adore), paperback (huge tick) and lovely floppy pages (ch-ching!). Yes I’m a geek. We go on to meet Sugar a prostitute working in a brothel run by Mrs Castaway, who incidentally is also Sugar’s mother. Sugar is known locally as the girl who will do anything or perform any act for any man. She is also highly intelligent, wise and knowledgeable in lots of areas. She already stands head and shoulders above the other girls as she can read and is also secretly writing her own manuscript for a dark and violent novel. She isn’t the most attractive girl but at 19 she is wise beyond her years and has a certain charisma that draws the customers in. One such customer is Mr William Rackham, poised to take over his fathers perfumery business and not being best pleased about it. During one drunken depressed evening in London, William decides to pay a visit to Mrs Castaway’s where he meets Sugar. He quickly becomes obsessed with her, and the story follows the various stages of his efforts to make her his own using his wealth and success. Purchasing her from Mrs Castaway, installing her in a secret residence (William is married), and then employing her as his child’s Governess in his home. We are introduced to various colourful characters along the way, William’s young wife Agnes who is suffering with an (undiagnosed) brain tumour and the various ways in which this manifests itself, namely her strange behaviour which the Doctors of the time attribute to her being ‘mad’ and pushing William to have her incarcerated in an asylum. I have absolutely fallen in love with this era and Michel Faber writes about it in such depth of detail that you can’t fail to be drawn in and become immersed in it. There’s no denying that at times this book is quite grim and dark and some of the situations and language used to describe them are quite graphic. It’s not entirely for the faint hearted but I have to say that I love the graphic nature and often found myself wondering ‘ewwwww I wonder if things like that actually happened?! It would take quite a bit to shock me. Some of the phrasing Faber uses is beautiful and I particularly love the French phrases that were in every day use at the time. For example calling an invitation ‘cartes d’invitation’ and an umbrella a ‘parapluie’. This book has made me want to read more stories set in Victorian London OR quite possibly research the era more in general. I find it fascinating. From the dirty streets to the upper classes it was all very intriguing. I think it is safe to say that I loved this book. I can rank it as one of my all time favourites and thoroughly recommend it. When I eventually reached the end I didn’t know whether I was satisfied with the conclusion or not….. In retrospect I think it was probably quite fitting. I now have Michel Faber’s The Apple to read, which is a series of short stories about the characters we met in The Crimson Petal and The White. I’m looking forward to seeing Sugar again hopefully…..
To sum up. Go and read Crimson Petal immediately! It’s not about perfume, that you never proffer, but more ‘own brand’ shower gel (whatever’s on offer). That pricey luxury chocolate selection, is more like battered cream cakes from the ‘whoops’ section. No buying of flowers to make me cry, more likely self raising that we put in fish pie. I don’t wear La Perla when I greet you at night, its more Marks n Sparks that are chewing gum white. It’s not vintage wine that gets my cork poppin, I’m just ever so grateful you do the food shopping. Feeding me grapes and fulfilling my whims? to be honest I’d rather you just take out the bins. Endless steamy nights? we’ve never been drier….all thanks to your purchase of our dehumidifier*. Last minute surprises, good food and fine wine? we’re just happy if the kids are asleep by half 9. It’s not because you’re sent from heaven above, it’s all about acts of everyday love. As you know I have a book obsession. I buy lots, I read lots. The way I look at it is there are plenty of addictions that I could have that are far worse to blow my hard earned readies on (or snort up my nasal passages, which is tricky to do with a hardback…I’d imagine). I currently have 41 books on my TBR shelf, excessive but comforting. Yes, comforting. I’m the kinda gal who panics a little bit if she doesn’t have a book about her person, (yes I always have a book in my bag like some ladies carry make-up for emergency purposes). Me in Sainsbury’s/Asda: *thinks* ‘I have enough books at the moment right?….maybe not….oooh look two for £7….no Mand you DON’T need any more books…..BUT ooooh that one looks good’…. *puts 2 MUST HAVE books in the basket alongside the Warbies loaf I actually came in for*. Me Online: *thinks* ‘I’ll just have a quick browse on Amazon, I won’t buy anything, I’m not stoopid…….ooooh that’s the one I saw on Booktube…..what’s that you say? only 1p secondhand with £2.80 postage? *clicks Buy Now*…. Me out shopping: *thinks* ‘I’ll just nip into the charity shops for a browse…..maybe do my bit for a worthwhile cause eh?……£1.50 for a relatively new release?…..Oh go on then, be rude not to. We should all be a bit more charitable after all’. So although I do buy a lot of books they are rarely full price new books. Obviously I’m justifying all this to you and myself…..and The Husband who rolls his eyes when packages start arriving….In fact last weekend I was upstairs changing the bedding (extraneous info there) and I heard the telltale rattle of the letterbox and distinctive thud of a newly acquired book on the doormat. I have never moved so fast, I was a blur flying down those stairs before the noise could register in The Husbands brain…..luckily he was bunged up with a cold so didn’t hear……thank god for congestion eh? This was an Amazon secondhand purchase and is apparently some spin off stories of the characters from The Crimson Petal and The White which I’m reading (and loving) at the moment. Can’t wait to get stuck in. I’ve picked up and put this down so many times in the chazza shop that this weekend I just thought ‘balls to it’ and bought it. Its about Michael Turner, a man who has just lost his wife and moved into a new house on a quiet street in Hampstead. He develops a close relationship with his new neighbours but all is not as it seems…..oooooh. As with the book above, I have picked this up lots of times in the charity shop and ended up putting it back down again. However yesterday I saw it again and it was a different version with a different cover which I much preferred (yes I DO judge a book by its cover). From what I can gather its about a man who slaps a child who isn’t his own at a barbeque full of friends and family and the ensuing consequences. It was longlisted for the Man Booker Prize in 2010 and its quite a chunkster so I may be leaving it for a while. (although having said that, I’ve just picked it up and flicked through it and it looks right up my street so I may end up reading it quite soon). This one was another secondhand Amazon purchase. I bought this because I don’t read enough of the ‘classics’ and I’ve heard plenty of good things about this and Jamaica Inn (which I may need to purchase after I’ve attempted this one). Amazon again! damn you! 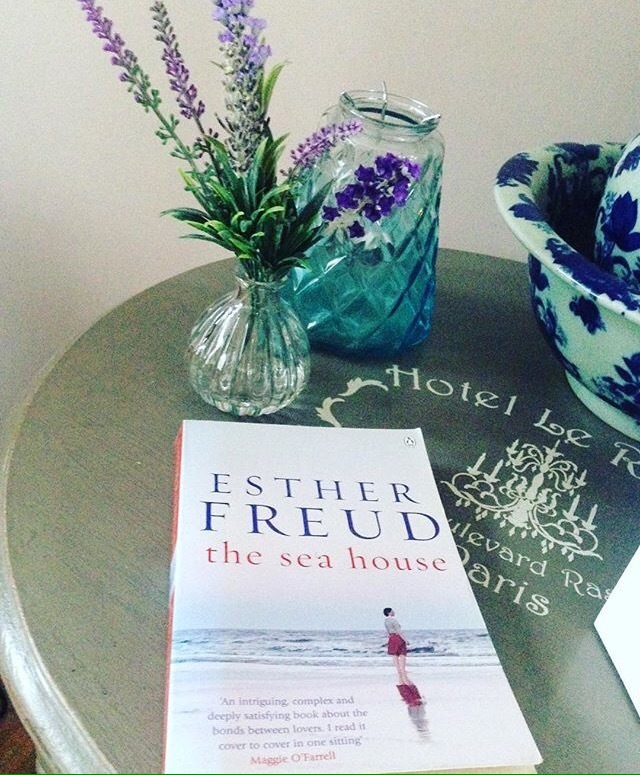 I bought this one after enjoying ‘The Sea House’ by the same author. I’ve written a little about it here, no other reason! simple. This was an Asda purchase. On a whim (remember that Warbies loaf I needed?) its about a woman with chronic neuropathic pain who finds her own suicide note but doesn’t remember writing it…..That’s as much as I know about this one. Another Asda special. 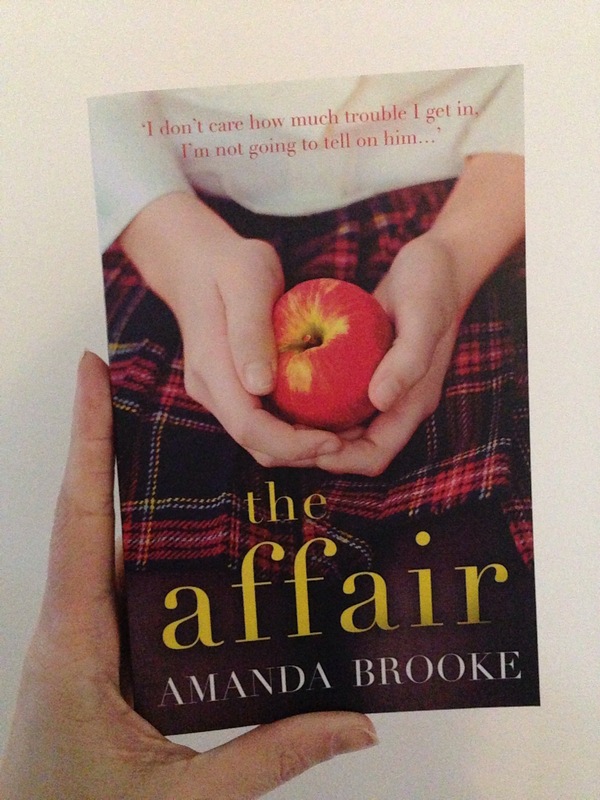 I like the cover, I like the premise of school girl/teacher affair with consequences and the author has a great name obvs…..That’s it. I may end up building a house out of my books when The Husband kicks me out. If you’ve read any of the above let me know what you thought. I’ve fallen back in love with reading over the last month or so. Not that I ever really fell out of love with it exactly, we just maybe had a couple of tiffs as all good lovers do. BUT I think I needed just to tear through some shorter ones and get my mojo back, and dear reader….I have done exactly that. I have read 7 books in January and started my 8th (another chunky one but oh so brilliant, more on that another time). I’m going to briefly sum up my January 7 for you, read on if you’re interested…….if you’re not then why aren’t you?…. 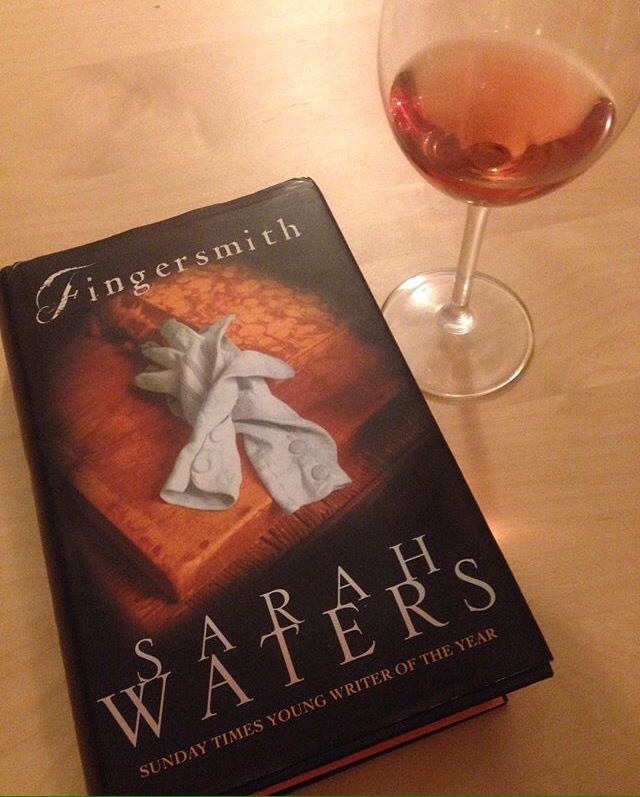 I luh-huv Sarah Waters writing and have mentioned her on here before. The first book I read of hers was The Paying Guests which was so not what I assumed it would be. It went far beyond my expectations. Fingersmith was another cracking read. So good in fact that I finished it and immediately ordered the DVD of the BBC mini series. (Not had time to watch it yet though). Fingersmith is set in Victorian London (which I have a new lust for, again more on that another time). It centres around two young girls, one destitute ‘fingersmith’ which essentially means pickpocket and one privileged niece of a wealthy book collector and how their lives intertwine when the fingersmith is sent to work as a ladies maid for the wealthy girl to infiltrate her dull but pampered life in order that her con man friend known as ‘Gentleman’ may marry her and rid her of her fortune. It has many twists I didn’t see coming, quite grim and in parts a bit gruesome but fascinating all the same. Can’t wait to crack on with the DVD. This was a short story collection revolving around as the title suggests ‘touchy subjects’. Some were quite serious, upsetting subjects such as miscarriage and post natal depression and some were more light hearted. My favourite of which was probably the one about a man who couldn’t tell his wife she had a massive hair growing under her chin. (Could have been written by my husband but I think we’ll leave that hair…erm I mean there!). Sooooooo disappointed by this. 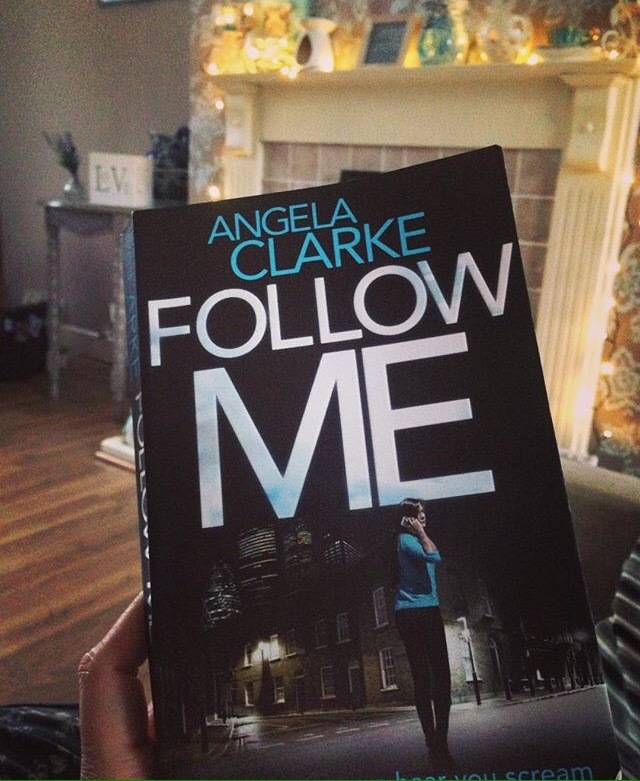 Totally unbelievable plot line and appalling characters…..not for me. That’s all I’m willing to say on it. Now this book I ordered after watching the trailer for the film at the cinema, and I mean literally just after watching the trailer, yes I was one of those dickheads with their phone out in the cinema, ssshhhh! This book is amazing! Heartbreaking and gut wrenching. I quite literally sobbed at a part near the end and I don’t do crying lightly my friends. I passed this book on to my husband and he did exactly the same….I’m sure he won’t mind me telling you (although if he does it’s tough now I’ve hit ‘publish’). 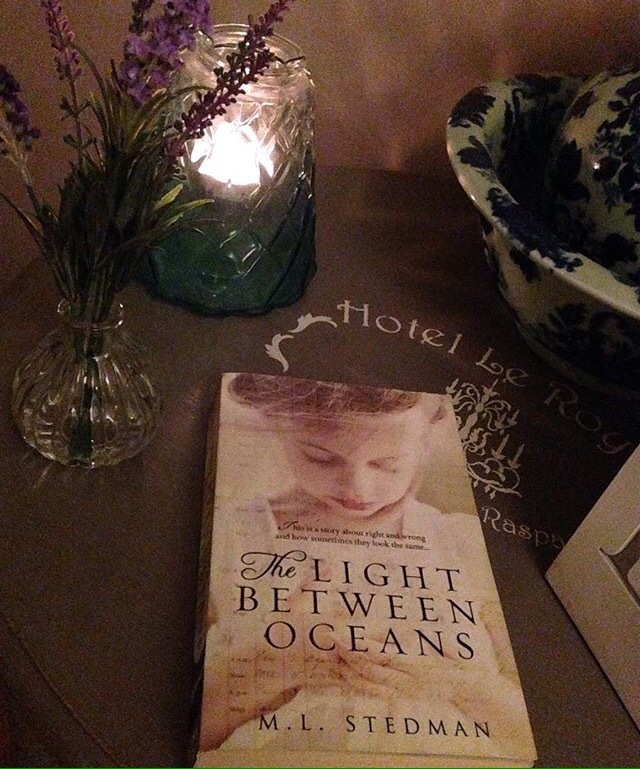 This is the story of Isabel and Tom who live on a remote island in Australia where Tom is the lighthouse keeper. Its set just after the first world war. Tom and Isabel have a lovely marriage and life on remote Janus but they have suffered the loss of three babies through miscarriage and still birth. One day a boat washes up on the island with a dead man inside and a live baby…..Isabel persuades Tom to keep the baby and pass her off as their own and the story and all the repercussions of their actions unfold from there. Read it (only when you are emotionally stable! You have been warned!). I picked this one up because I really enjoyed ‘The Lovely Bones’ and ‘Lucky’. This was totally not what I was expecting at all. 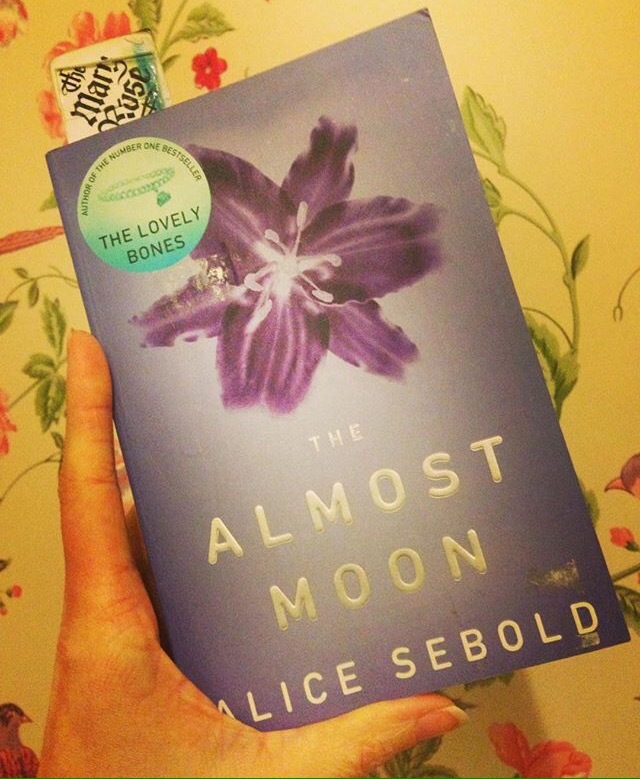 With a soft name like ‘The Almost Moon’ and lovely lilac cover with a flower on it I was defo not expecting it to open where the protagonist had just murdered her Alzheimer’s suffering mother. The story then follows the next 24 hours following the murder and dips back into the past to show how difficult the relationship between mother and daughter had been over the years leading up to the day of the murder. This book looks at mental illness and the effect it has on family members and friends. It’s grim and dark and shocking. BUT I still enjoyed it……weirdo. This one had been on my TBR shelf for over 12 months I reckon. I grabbed it because it was fairly short and I wanted something contemporary that was a quick easy read. Again, another dark story which was a slow burner on the creepy scale. Insidious and sinister but not ‘in your face’. The story follows Jane who is Scottish but has just moved to Berlin to be with her girlfriend Petra and have their baby. She is quite alone in an unfamiliar city and finds herself getting obsessed with a young girl called Anna who lives with her father in the apartment above. Jane is convinced that Anna is being abused and is hell bent on saving her whether Anna wants her to or not. 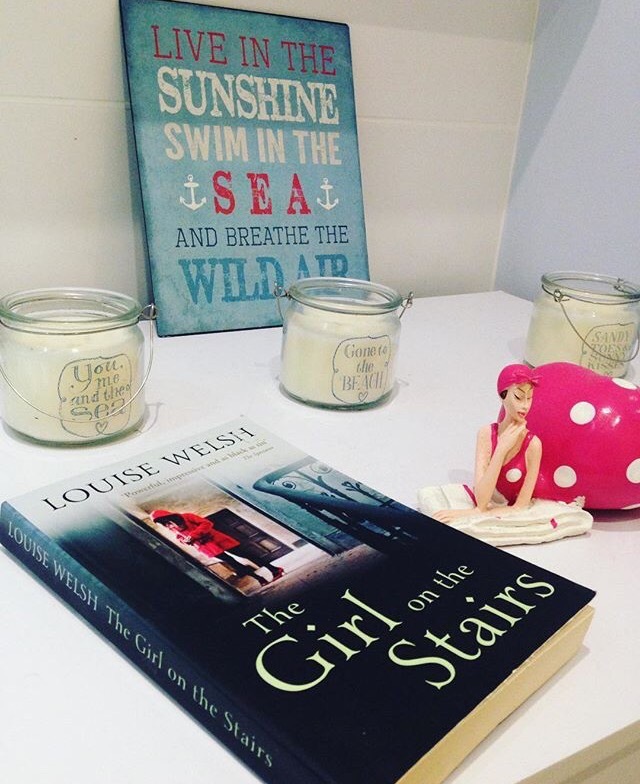 I enjoyed this one and need to look up more of Louise Welsh’s stuff. The book I started after this one is called The Crimson Petal and The White. Its huuuuge but oh so good! 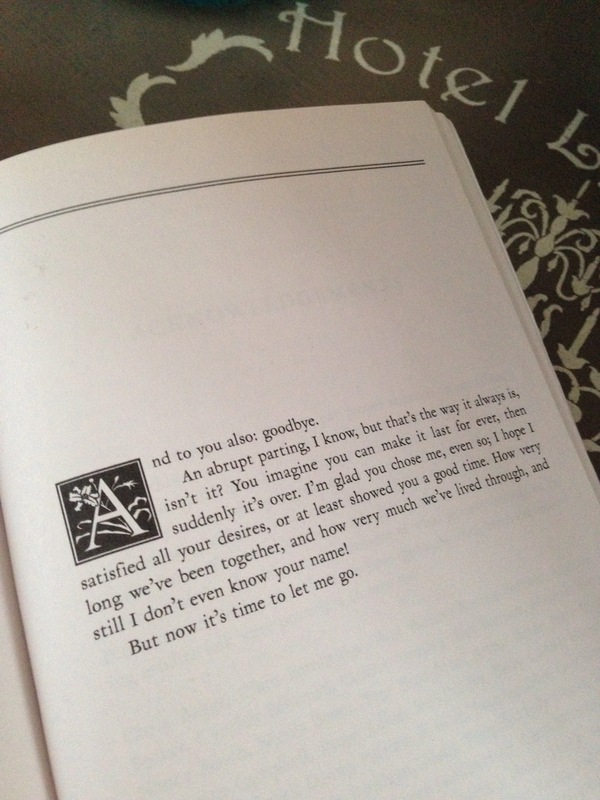 I don’t want it to end! I will review this one separately as it falls into February’s books anyway but I think it deserves a blog post all of it’s own. So that’s me book wise for January. 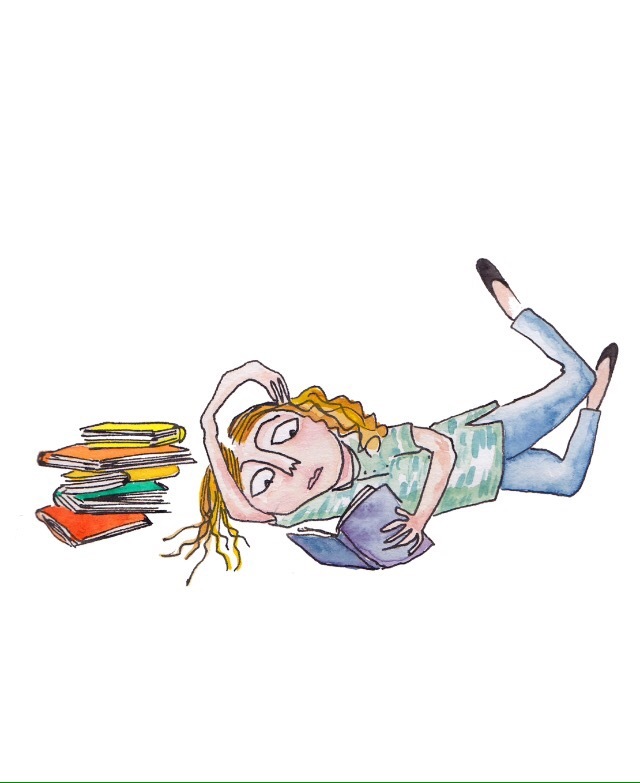 I think the blog might take a little bookish turn but won’t always be about books/reading. I’ll still be here waffling rubbish about my life, diet, anxieties, kids etc. I hope you’ll stick with me.